all this happiness: I Remembered Spring. I think I did, or do, anyway. There is this thing that happens in the morning when you leave the house and realize you don't need the coat you're wearing. It's like a catch of breath, or a skipping step, or the lightest and most sentimental of breezes. Spring does that, even though I use to hate it when I was a kid--insisting that it was too pastel! The first flowers out require so much attention, the hogs! But this week I remembered it, bare arms and puddles, just enough to feel less anxious that it's still winter. I was going to call this post A Morning of Pale Spring Still Clinging to Winter's Chill, because my dayis sometimes little more than a string of Lord of the Rings references but I know better. It is not spring, no matter how much we tried to pretend today, hallucinating beauty in the piles of snirt (snow+dirt) full of cigarette butts from December clinging to the curbs. I know where I live, and this is no real spring, but a little preamble reminding us that eventually it will be here for real. Until then, I will collect these precious days of fleeting warmth and make the best of them, even if I would rather sit on the floor all day. I am also going to confess something that doesn't really bother me, but might a little bit. I really love this skirt. I first wore it in February 2009 (when my hair was shorter then, too! ), and it's become one of my favorites. The downside is that I work at a bakery, and I eat a croissant (either plain or filled with nutella) pretty much every day if there is not something else (puff pastry covered in apricot glaze or a giant slice of cake) that I fall in love with and need to eat. As such, this skirt fits, but is so tight that I worried about potentially passing out or bursting the button this morning. Thankfully, a hair-elastic saved from the floor acted as my savior, and gave me an extra inch of breathing room. I feel like these are the kinds of things oft-admitted to on blogs. But you know. These things, they happen, and croissants are my tongue's promise to my soul (I don't know, I just love food). This is also the first meeting, on this blog, of my new little pin-friend! Over the summer I fell in love with a seahorse gentleman trapped inside a window at an antique shop. He was not to be had but my mother, in her infinite brilliance and ebay savvy ways, found this little guy and wrapped him up for me for Christmas! He is the trickiest thing to photograph, but the loveliest little creature I have ever seen. His tail is long and stepped, and it curls at the bottom. I have to keep myself from talking to him when I am in public. The seahorse pin is a vintage Robert Zentall. He fled Europe with friend Etienne Aigner during WWII. In the 1950's and 1960's they designed and created fashion accessories. Photos, as usual, taken by John. oh gosh i really love this outfit so much. the blazer is perfect and your hair looks fabulous! I know how you feel about you little sea horse pin, I have a little lamb pin that I named sam, I act like he is a real living lamb (that can understand english of course). Animal pins are too cute not to talk to I think! i love your little sea horse pin! it is so cute! Haha, I love the word snirt. I am totally using that for it now. I found myself thinking I liked your seahorse pin before you even mentioned it. And hey, enjoy the croissants, there are a lot more little plaid skirts out there if this one isn't cool with tasty food, hah. You have the most porcelain- delicate skin. And lovey lovely hair! I love the outfit, especially your shirt! 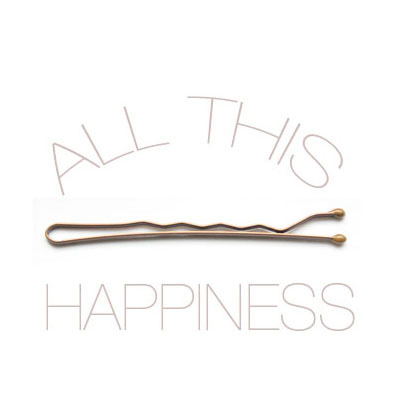 And I also think the bangs are a great look on you, your hair looks lovely! One of those pictures that makes me want to chop mine again! Great Outfit and your Wellies give it that added dash. Your hair looks unbelievably gorgeous in these pictures. It's always nice to see a bit of tartan kilt-ness as well. And I know exactly what you mean about Nutella filled croissants! I love the outfit. It seems to be "school-girl" inspired, which you really rock. I'm in love with your style and your blog. Oh, what a lovely post... Your writings are so delicate and poetic. I appreciate that you shared with the world that an elastic band enables you to keep eating croissants (yey! eating! ), and we've had the exact same preview of spring here in Chicago. I might have underdressed that day, and now I'm spending my weekend in bed with a cold. I think that's what you get for forgetting what season it really is. I love your hair in these pictures! And the sea horse pin is too cute for words. This has inspired me to go buy something with a seahorse on it, and then eat a croissant. The outfit is perfect. I love that blazer and the J. Crew blouse is amazing! I love it! Love this outfit and the little seahorse pin! Happy Spring! Your bangs are looking amazing! And I really think I am addicted to eating at least one delicious buttery baked good every day since I have arrived in Japan! Oh, these jeans, how they bind! Without becoming too fan girly - I love your blog and this outfit. The seahorse pin is darling! Your blouse is very pretty! One of the joys of kilts is that they allow you to move the buttons (and make extra room for croissants)! Your outfit is absolutely fantastic, and I love your little sea horse friend! It also makes me ridiculously happy to find out that I'm not the only one who sometimes has Lord of the Rings quotes going through her head all day! I LOVE IT ALL. The bangs/fringe/whatever you call it really, really suits the awesome sharpness of your cheekbones. Your eyeliner is amazing too. All this talk of weight gain and here I was thinking you were the Goodyear blimp or something - not the case at all! You look great and this post has really, truly inspired me to get out of this funk and put effort into my clothes. that seahorse pin is lovely! the whole outfit is just wonderful. your hair is adorable! I just found your blog! I really like your outfit! Oh, and I love the wellies! you are sooo pretty and all your outfits are wonderful! this is such a lovely post. "My tongue's promise to my soul." Why didn't I think of that? It's so true. It's why it's ok to be indulgent, because we're owed these things as humans!!! Just beautiful, esp the photos and the 'fit, but mostly getting to know more about you and your pastry affairs. Magic. Gorgeous outfit. I totally identify with you about springtime! Love the LOTR reference btw. I'm a huge HP and LOTR fan. This outfit is just so pretty on you. I love the polka-dot top and the way you paired it with a cute little preppy school girl look. Adorable. you look so lovely and grown up with your fringe in these photos! and i can't get enough of the seahorse pin! 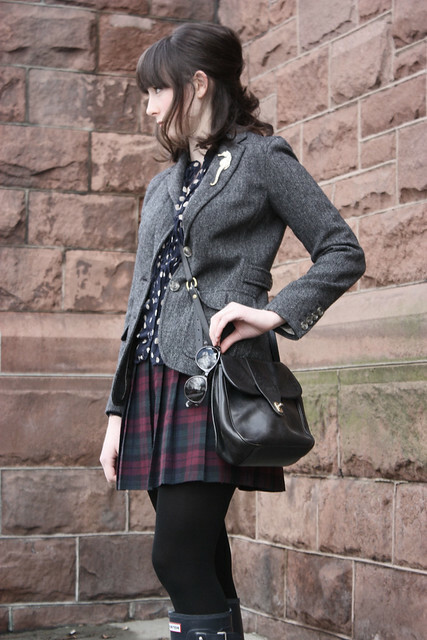 i love your blog posts :)the blazer and brooch are gorgeous. the gumboots are an awesome touch too! Adorable outfit! 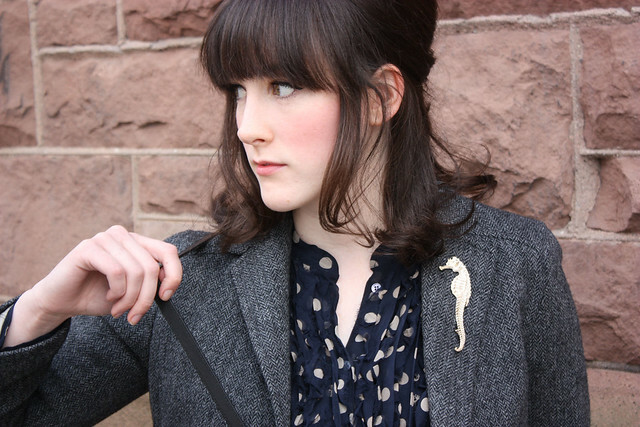 The sea horse pin is lovely and the skirt is amazing. Gotta love those croissants, right? Oh Really love this college look! You look amazing! I love your blazer! Beautiful look! Inspired to accessorize with pins! Yay..Hunter rain boots! I've got the same ones but in red :) I'm also loving that blazer. LOve this outfit of yours!! !